Update, 3:42: Naghmeh Abedini filed court documents to legally separate from him the same day he returned home to Idaho. An American pastor who was imprisoned for nearly four years in Iran returned home to Boise on Tuesday. And his wife has filed legal papers to keep her children in Idaho. KBOI-TV reports that Saeed Abedini landed around 4:40 p.m. on a private plane. Sunday started as a cold and icy morning. As the fog began lifting in Boise, Sunday morning radio programing was interrupted as President Obama stepped up to the podium at the White House. A senior U.S. official says the plane carrying Americans who had been imprisoned by Iran has left Tehran. The Obama administration official isn't saying whether all four Americans were on the plane, just that those "who wished to depart Iran have left." Among those released as part of a deal between the American and Iranian governments is Saeed Abedini, a pastor from Boise. On Twitter, his wife Naghmeh said her husband has left Iran. Update, 10:15 a.m., Monday: The family of Idaho pastor Saeed Abedini is planning to reunite with him on the East Coast. Abedini's wife, Naghmeh, told the Idaho Statesman Monday that she and her two children will fly to meet him on the East Coast to heal and reconnect with him. She says her husband is currently being treated at a U.S. Army medical facility in Germany. After hearing testimony from four families, U.S. lawmakers passed a resolution calling on Iran to release three jailed Americans and provide information about a former FBI agent who disappeared in Iran in 2007. As the June 30 deadline for a nuclear deal with Iran approaches, the families say it's time for the U.S. to push hard on this issue. Among those who spoke Tuesday before a hearing of the House Foreign Affairs Committee was Daniel Levinson, son of former FBI agent Robert Levinson. The Senate has unanimously passed a resolution calling for Iranian officials to immediately release a Boise pastor and two Americans held in Iran and help locate a fourth. The lawmakers on Monday called on Iran to free Saeed Abedini, Amir Hekmati and Jason Rezaian and cooperate with the U.S. government to locate and return former FBI agent Robert Levinson, who is believed to be missing in Iran. Abedini, a Christian pastor from Idaho, has been in Iranian custody since September 2012 and is serving an eight-year sentence for undermining state security. In the midst of an unexpected break in Iranian nuclear talks, President Barack Obama is calling for the return of Americans held in Iran, including Boise pastor Saeed Abedini. 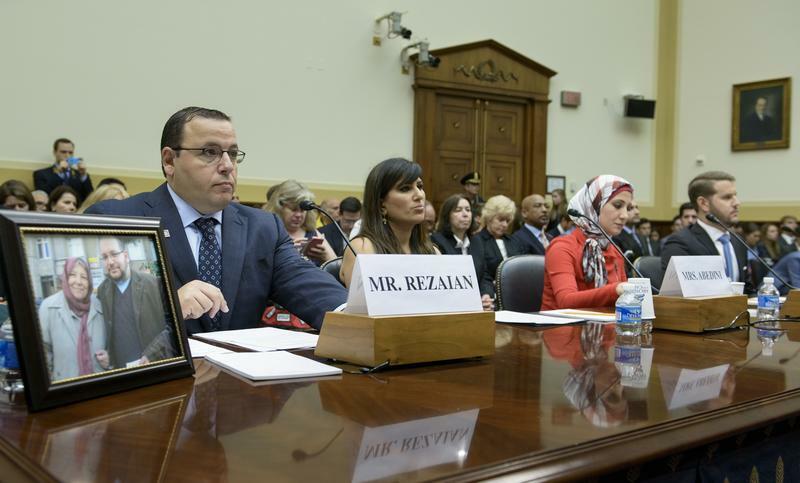 Senators at a subcommittee hearing have been told that high-level U.S. attention to Iran's imprisonment of American Pastor Saeed Abedini is helping to keep him alive. Abedini has been in Iranian custody since September 2012 and was sentenced to eight years in prison for what was termed undermining state security. President Barack Obama has called for the Christian pastor's release and met with his wife and children in Idaho in January. Naghmeh Abedini says she misses her husband and fears for his safety. It’s been two years since Boise pastor Saeed Abedini was sentenced to an Iranian prison, accused of undermining state security by trying to establish a network of Christian churches in private homes. His supporters will hold a prayer vigil for Saeed Friday. The wife of an American pastor who's been imprisoned for 18 months in Iran says he's doing better since being transferred to a hospital recently. Naghmeh Abedini told Faith Radio that her husband, the Rev. Saeed Abedini , is now receiving better meals and pain medication. She says he still needs surgery, however, for injuries he suffered in prison.